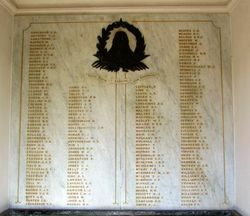 Glebe War Memorial commemorates those who died in service or were killed in action during World War One. The monument is in the form of a shrine with an interior chamber listing the names of service personnel. 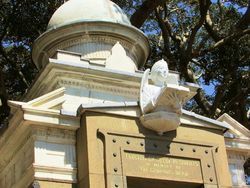 The bust of an angel acts as a sentinel over the entrance to the enclosed chamber, while on the left is the bust of an Australian soldier, complimented on the right by a sailor - all fashioned in white marble. Various bronze motifs, including a State of New South Wales laurel wreath, the face of a woman within a laurel wreath and remembrance torches add to the design. 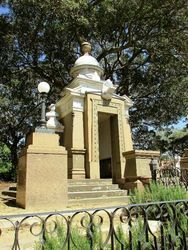 The Governor-General, Lord Forster, yesterday afternoon unveiled the Glebe Soldiers' Memorial, and Lady Forster unveiled the busts of a sailor and a soldier which stand on either side of the central shrine. Mr T. Keegan M.L.A. welcomed their Excellencies on behalf of the local committee. He said that he believed the memorial to be the finest of its kind in the State. 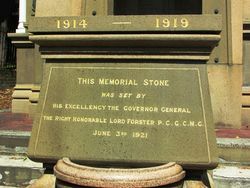 Lord Forster said he had a keen recollection of laying the foundation stone of the shrine. It was right and fitting that so fine a memorial should be unveiled on the solemn anniversary of our day of great trial. 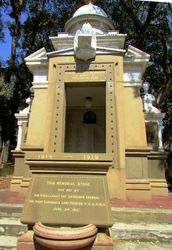 The monument is in the form of a cenotaph shrine covering an area of 22ft by 19ft and rising to a height of 35ft above the footway. 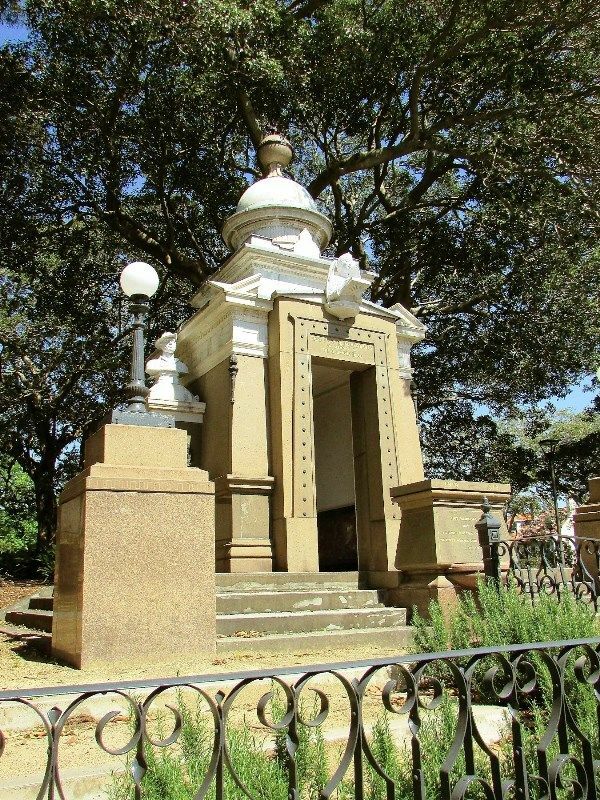 At the two front corners of the base, the steps of which are of blue freestone, are blocks of axed, polished, and chased red granite supporting ornamental standard electric lamps. Between these there is a rostrum with granite base and also a moulded and polished trachyte cap forming a desk and a fountain basin wrought out of solid granite. On two sides, pedestals of trachyte support four columns of white marble. These pillars are canopied in finely chiselled and moulded white marble one supporting the bust of a soldier and the other of a sailor. The shrine in the centre contains the names of 157 men who were killed. The honorary designer and architect was Mr. W. Martin who also personally supervised the erection. The Sydney Morning Herald (NSW), 26 April 1922. The Right Honorable Lord Forster P.C. G.C.M.G.